This is the 13th page , (page numbered 17 in the book) from the third issue of the first Magik Limited series. The art was created in 1983 but wasn't printed until Feb 1984. THe page prominently features Illyana Rasputin/Magik as she sneaks into Belasco's library. She is then stopped by Storm before recovering to another fight. This is a good page for a follower of the X-men by the legendary Ron Frenz (Thor, Spider-man, Spider-Girl) and inker Tom Palmer. This is a great Momento of the X-men legacy. 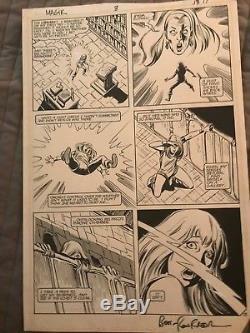 The item "Original Comic Art Page Magik LS Issue 3 Page 13(17) Ron Frenz & Tom Palme(1984)" is in sale since Sunday, September 17, 2017. This item is in the category "Collectibles\Comics\Original Comic Art\Interior Pages". The seller is "wildblue3" and is located in Columbia, Maryland. This item can be shipped to United States, Canada, United Kingdom, Denmark, Romania, Slovakia, Bulgaria, Czech republic, Finland, Hungary, Latvia, Lithuania, Malta, Estonia, Australia, Greece, Portugal, Cyprus, Slovenia, Japan, China, Sweden, South Korea, Indonesia, Taiwan, South africa, Thailand, Belgium, France, Hong Kong, Ireland, Netherlands, Poland, Spain, Italy, Germany, Austria, Russian federation, Israel, Mexico, New Zealand, Singapore, Switzerland, Norway, Saudi arabia, Ukraine, United arab emirates, Qatar, Kuwait, Bahrain, Croatia, Malaysia, Brazil, Chile, Colombia, Costa rica, Panama, Trinidad and tobago, Guatemala, El salvador, Honduras, Jamaica.